You are here: Home / VMware / Horizon Mirage / Horizon View & Horizon Suite: Per Concurrent or Per Named User Licensing? When you purchase this upgrade (50% off promotion starting this week btw), your View Premier bundle licensing is exchanged for Horizon Suite licensing and your View Premier per concurrent user licensing is exchanged for per named user licenses. When you upgrade from View Premier bundle licensing to Horizon Suite, you get two named users of Horizon Suite for every one concurrent license of View Premier exchanged. The 2fer can work out in favor of many View customers. Mirage was per-named-user before VMware acquired Wanova. Horizon Application Manager (the predecessor to Horizon Workspace) was also per named user. This swap brings View in line with licensing terms of the other end user computing offerings in the suite when licensed as part of the Horizon Suite. 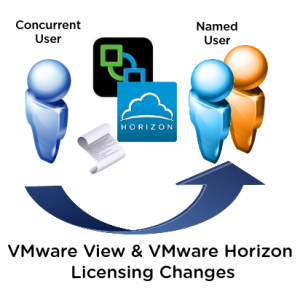 If you want to keep using View Premier only and not upgrade to the Horizon Suite licensing, you can keep using the per concurrent user licensing. You are not being forced to change licensing terms like Citrix did to XenDesktop customers a few years back. Details of the licensing changes can be found in this VMware Horizon Licensing and Upgrading Whitepaper: http://www.vmware.com/files/pdf/view/VMware-View-Pricing-Licensing-and-Upgrading-white-paper.pdf. This whitepaper also covers the announced End of Availability for View Enterprise edition, Horizon Application Manager, and ThinApp. I have more info on the ThinApp EOA here: http://vmtoday.com/2013/02/the-reports-of-my-death-have-been-greatly-exaggerated-vmware-thinapp/.